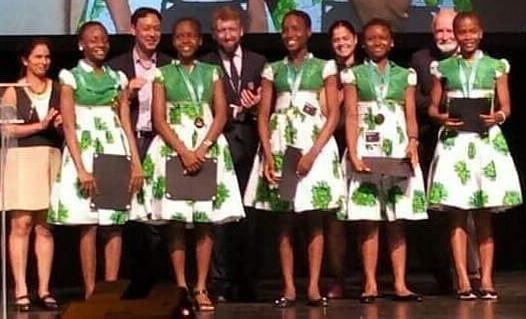 Five Anambra girls from Regina Pacies Secondary School Onitsha who represented Nigeria and Africa at the World Technovation Challenge in the Silicon Valley in San Francisco, US last night have won the Gold Medal in the contest. The team, led by Uchenna Onwuamaegbu Ugwu defeated representatives of other technological giants including the USA, Spain, Turkey, Uzbekistan and China to clinch the gold medal. The Anambra girls who have now become Africa’s Golden Girls are; Promise Nnalue, Jessica Osita, Nwabuaku Ossai, Adaeze Onuigbo, Vivian Okoye. The world champions who are reported to be attracting a lot of attention in the world’s greatest technological hub won the Challenge with a mobile application called the FD-Detector which they developed to help tackle the Challenge of fake pharmaceutical products in Nigeria. Under the tutelage of Uchenna Onwuamaegbu-Ugwu the CEO of Edufun Technik STEM, the Golden Girls spent five months researching and developing FD-Detector which swept through over 2000 competing applications to get to the finals in San Francisco. Technovation is a programme that offers girls around the world the opportunity to learn the programming skills they need to emerge as tech-entrepreneurs and leaders. Every year, girls are invited to identify a problem in their communities, and then challenge them to solve them by developing Andriod applications that would address those problems. 115 countries participated in the qualifiers but only 12 teams from all over the world were selected as finalists for the pitch in Silicon Valley. The girls will also be attending Field trips, life-changing workshops including a networking session during their one week stay in USA. The Governor of Anambra State, Willie Obiano had personally sent them off to the US in a brief ceremony at the last Executive Council Meeting where he charged the girls to put Nigeria and Africa on the global technological map with their rare talent.